It's no secret that online shopping has taken over. From household goods to jewelry, there's hardly anything you can't find and buy online. Sure, there are a few items, select clothing pieces included, that you still like to buy IRL since nothing beats trying them out before you purchase them, and jeans used to be one of them. However, it's almost 2019, and we're leaving the exasperating task of trying on jeans in the past. Sure, there's one side of our brain that says buying denim online involves a 50% chance things might go terribly wrong. But thanks to improved customer service and return policies, buying jeans online is getting better than ever, so there's no need for you to torture yourself in awkward fitting room lighting. You can do that in the comfort of your own home. So, being the jean enthusiasts we are here at Who What Wear, we've been slowly listing all of our favorite places to buy jeans online. From the best online stores where you can find all your favorite names (Levi’s, 3x1, Paige) to brands with a cult following on Instagram (hi, Everlane) to labels that are all about inclusivity (Madewell and Warp + Weft), find the 10 best places to buy jeans online ahead. Nothing beats a pair of black jeans. Perfect for all your winter-white outfits. The bottoms of this pair of jeans are convertible. Need we say more? Chino + jeans = yes, please. Always down for a good raw ankle hem. There's nothing like some perfectly calculated rips in a pair of light-wash jeans. They don't call it an "icon fit" for nothing. Mom jeans are still alive and strong. The wrap-waist detail really sells this pair of jeans. These are on sale, so it's an automatic yes. The perfect dark wash for your work outfits. These jeans will look great with all your mules. Nothing is more satisfying than wearing a pair of jeans that falls just where your ankle boots end. For this price, these straight-leg jeans are a must. Relive the '90s with this pair. We all need a pair of wide-leg trousers that don't require heels. Contrary to some recent pushback, skinny jeans are still a thing. Of course, you need another pair of black jeans. Zippers are so last year. Say hello to your new pair of comfy, wear-with-everything jeans. Let your mom-jean collection grow with this white pair. Who doesn't love a good vintage-inspired jean? 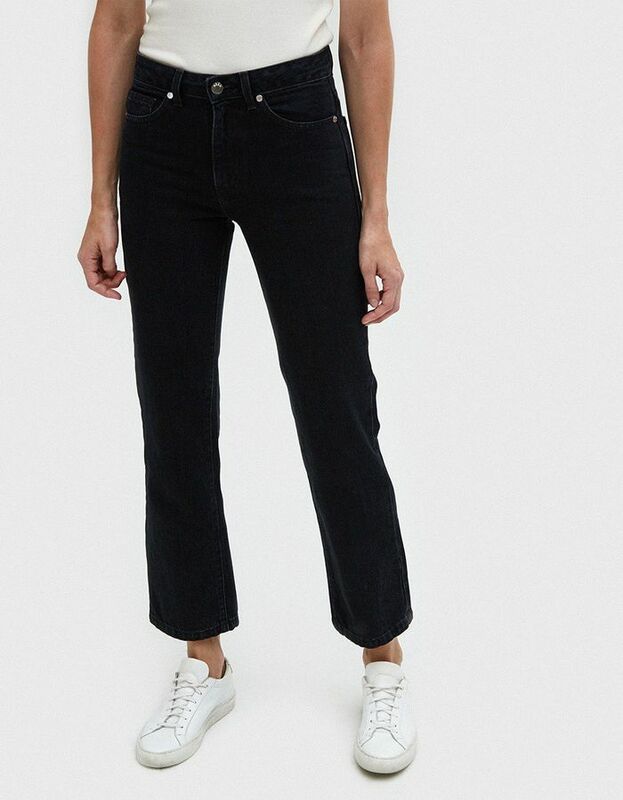 How can you say no to Everlane jeans? Dress these raw-hem jeans down or up with sneakers or some nice kitten-heel mules. This blue wash is perfect. More straight black jeans, because why not? These are 50% off right now. Get them before they're gone. Need jean outfit inspiration? Here are five outfits we can't stop thinking about.